Outdoor enthusiasts love the cool, crisp air that fall brings, and one of the best ways for an any outdoor enthusiast from Columbiana County, Ohio, to Cuyahoga Falls, Ohio, to enjoy the exotic color display is by riding a variety of trails. East Central Motorsports provides free layaway on their already affordable youth ATVs, UTVs, and bikes, as well as arms them with ATV safety tips and off-road riding accessories so that they can have an exciting and successful adventure. This local ATV and off-road bike dealer stocks a wide selection of SSR pit bikes and Coolster quads that allow the entire family to reestablish their close bonds while exploring all that nature has to offer. East Central Motorsports also carries ATV parts, can repair any sized issue presented to them, and offers superior customer service. They are proficient at helping those who are debating when to use an ATV versus a UTV as well. Everyone from Kent, Ohio, to Pittsburgh, Pennsylvania, can call, visit, see them online today for help getting ready for fall riding. Customers from Pittsburgh to Columbiana County return to East Central Motorsports repeatedly throughout the years, because they appreciate how this local ATV and off-road bike dealer strives to provide their customers with the best experience possible when purchasing their machines. Parents will appreciate the wide selection of Coolster 110cc quads available at only $699 with its amenities that are geared toward safe, family fun — including a single-cylinder 4-stroke Honda Clone engine, electric start, fully automatic transmission, speed limiter, remote kill switch fob, battery charger, and 145/70/6 tires. Additionally, the kids will appreciate the fun designs, like Pink Camo, Spiderman, and so much more. East Central Motorsports offers ATV models in sized that range from 125cc to 175cc. They also offer a vast array of automatic, semi-automatic, or manual shift SSR pit bikes in a variety of colors and sizes ranging from 70cc to 189cc. 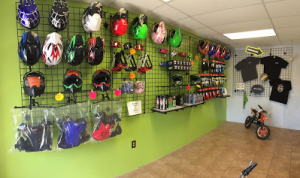 This local off-road bike dealer not only offers free layaway of bikes, ATVs, UTVs, and other products, but they also provide ATV parts and repair, as well as off-roading riding accessories. 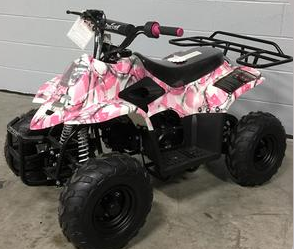 Outdoor lovers from Cuyahoga Falls to Kent may walk into East Central Motorsports with the idea of finding an affordable youth ATV to surprise their daughter only to discover that this they carry many options on which they can navigate the trails, such as affordable bikes and UTVs. With the options that are available, clients wonder when to use an ATV versus a UTV. ATVs operate well in tight woods and are best suited for quick turns. They are perfect for situations where the rider will need to quickly hop off and on or for hauling small cargo loads. ATVs are easier to tow to various locations and are especially good for racing. They are more physically demanding to ride as they require the rider to use their entire body to balance and control it. If someone is looking at cost being a factor, typically ATVs and any desired modifications are less expensive than UTVs. A UTV will be more applicable when there is a large amount of cargo to haul, especially if it’s a long ride, since it allows the occupant to sit straight up in a seat, instead of in a hunched over position. They are available in sport models, but it’s more like strapping in and enjoying the ride compared to the vigorous riding nature of an ATV. 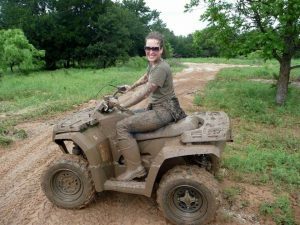 Whether someone is going mudding or teaching their son how to ride, they can also count on East Central Motorsports for products that will get them ready for fall riding and ATV safety tips, which include wearing safety gear, following the rules, knowing the terrain, and getting ATV safety training. Whether someone in Columbiana County, Ohio, is looking for a Coolster quad to that will help them effectively scout their hunting land or a parent in Pittsburgh, Pennsylvania, would like an affordable youth ATV to introduce their child to the excitement of the open air caressing their cheeks and get them ready for fall riding, East Central Motorsports is a full-service dealer. They offer everything from free layaway on their already affordable youth ATVs, UTVs, and SSR pit bikes to ATV parts and repair, off-road riding accessories, and safety tips. Individuals who are debating when to use an ATV versus a UTV can discover all the differences from the knowledgeable family who owns and operates this local ATV and off-road bike dealer in Kent, Ohio. Riders in Cuyahoga Falls, Ohio, and beyond can rely on the expertise and high-quality products that they will find with one phone call or visit to East Central Motorsports. This entry was posted in Business to Business, Doors/Garage Doors, Garage Door Sales & Service, Home Improvement and tagged affordable UTVs Pittsburgh Pennsylvania Columbiana County Cuyahoga Falls Kent Ohio, affordable youth ATVs Pittsburgh Pennsylvania Columbiana County Cuyahoga Falls Kent Ohio, ATV parts and repair Pittsburgh Pennsylvania Columbiana County Cuyahoga Falls Kent Ohio, ATV safety tips Pittsburgh Pennsylvania Columbiana County Cuyahoga Falls Kent Ohio, Coolster quads Pittsburgh Pennsylvania Columbiana County Cuyahoga Falls Kent Ohio, East Central Motorsports, free layaway on ATVs Pittsburgh Pennsylvania Columbiana County Cuyahoga Falls Kent Ohio, free layaway on bikes Pittsburgh Pennsylvania Columbiana County Cuyahoga Falls Kent Ohio, free layaway on UTVs Pittsburgh Pennsylvania Columbiana County Cuyahoga Falls Kent Ohio, get ready for fall riding Pittsburgh Pennsylvania Columbiana County Cuyahoga Falls Kent Ohio, local ATV dealer Pittsburgh Pennsylvania Columbiana County Cuyahoga Falls Kent Ohio, local off-road bike dealer Pittsburgh Pennsylvania Columbiana County Cuyahoga Falls Kent Ohio, off-road riding accessories Pittsburgh Pennsylvania Columbiana County Cuyahoga Falls Kent Ohio, SSR pit bikes Pittsburgh Pennsylvania Columbiana County Cuyahoga Falls Kent Ohio, when to use ATV versus UTV Pittsburgh Pennsylvania Columbiana County Cuyahoga Falls Kent Ohio by admin. Bookmark the permalink.